I received an invitation to an art exhibit organized by the Actors Guild of the Philippines for the benefit of Karapatan’s Free All Political Prisoners Campaign and Welfare Fund. 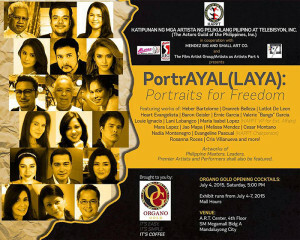 The Actors Guild of the Philippines in cooperation with the Mendez Big and Small Art Co. and The Film Artist Group presents the benefit exhibit for Karapatan’s Free All Political Prisoners Campaign and Welfare Fund entitled “PortrAYAL (LAYA) 1: Portraits for Freedom” featuring the artworks of Heber Bartolome, Reb Belleza, Lotlot de Leon, Heart Evangelista, Ernie Garcia, Valerie “Bangs” Garcia, Baron Geisler, Louie Ignacio, Lani Lobangco-Santos, Maria Isabel Lopez, Jao Mapa, Melissa Mendez, Cesar Montano, Nadia Montenegro, Evangeline Pascual, Rosannna Roces, Cris Villanueva, and others. Opening cocktails for the exhibit will be on July 4, 5pm at the Art Center, SM Megamall, 4th Floor, Bldg. A, Mandaluyong City. 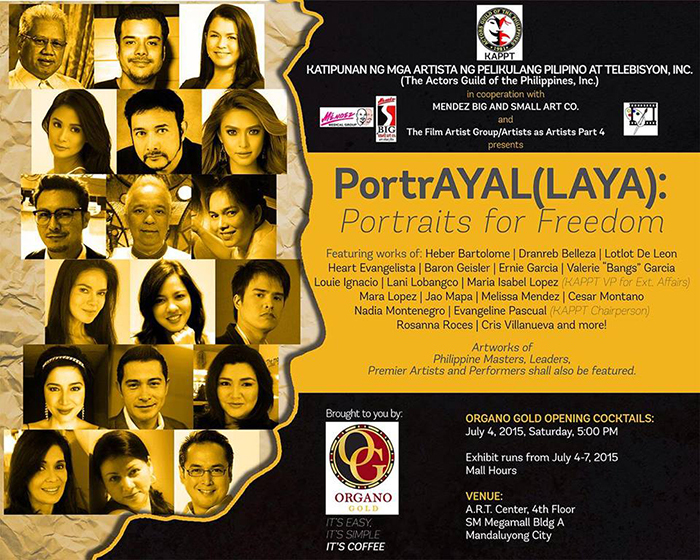 Exhibit runs until July 7, 2015. This entry was posted in Charity Work, Inspirational, Social responsibility and tagged art exhibit for a cause, free political prisoners, local artist, portraits for freedom on July 6, 2015 by Yami. Here’s the list of areas and offices where you can bring food and other donations, or volunteer for our brothers and sisters who were affected by the Southwest Monsoon. 2 Million individuals from 89 cities and municipalities in NCR Regions I, III, and IV-A were affected by the brutal Southwest Monsoon. Despite this unfortunate catastrophe, we believe that the spirit of Bayanihan is alive and overflowing in Filipino hearts as our citizens reach out to fellow Filipinos who have lost their homes to flee for safer grounds. This entry was posted in Charity Work and tagged assistance, bayanihan, donation, help, relief, southwest monsoon, volunteer on August 10, 2012 by Yami. Do you know what it takes to be a social worker? I have met a few social workers in the past. Some of them are moms like me. They work in half-way house for older people and some in orphanages. Their devotion to their work was simply amazing. They treat everyone at work – babies and old people alike – as their own family. They feed, bathe and clothe them with care. I asked one mom social worker about her work and she said she felt like home when attending to the homeless individuals. I have learned that one must have a big heart to extend assistance to others. If we can be trusted with material handling what more with a fellow man who are not as physically capable like us. You don’t have to be someone else; you only need sincerity to be of help and make a difference in someone else’s life. Now, do you have what it takes to be a social worker? This entry was posted in Charity Work and tagged life of social worker, social worker, traits of a social worker on February 7, 2012 by Yami.